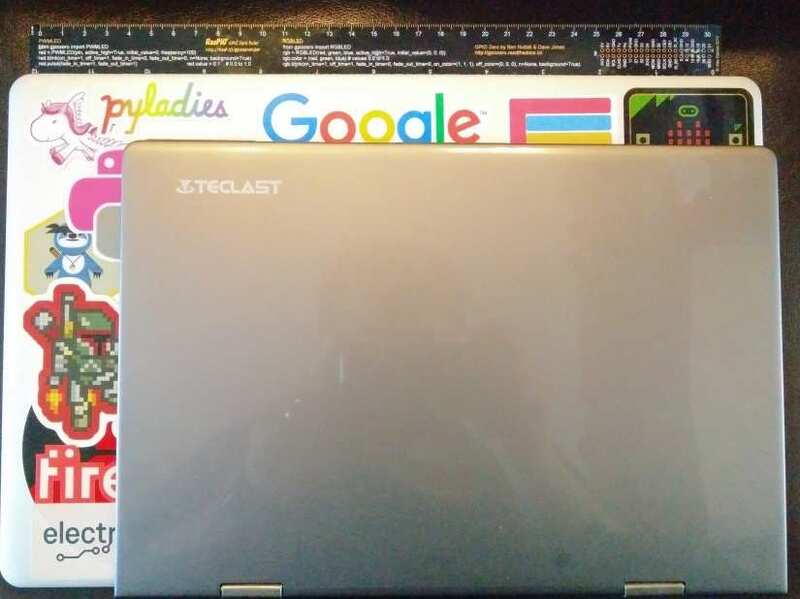 The Teclast F5 is a much smaller laptop, in fact, it is smaller than a sheet of A4 paper at 27.4cm x 18.8cm x 1.2cm and it is light weighing only 1.1kg so you will not notice it in your rucksack. Looking at the specs, our first thought is “Can this run Windows 10?” And you are quite correct to think this. The Intel Celeron N4100 is the latest low power chip from Intel and when not in demand, it does run at 1.1GHz, but it can boost up to 2.4GHz when needed and this can be further improved by altering the power settings in the BIOS (just be careful!) And with this chip forming part of the new Gemini Lake chipset, we also see around 25% speed improvement over the previous Apollo Lake series CPUs (of which the Teclast F7 is based.) So the Windows 10 experience is pleasant and responsive with very little lag, except when we really push the machine with multiple Chrome tabs, applications etc. The machine comes pre-configured and ready for use, so no Windows 10 setup is required. This does raise an eyebrow, as this means that the Windows install has been automated in the factory, and there have been a few horror stories of machines coming pre-installed with various malware/viruses. The first step we took was to update the system and run a full scan of the drive for any nasties. Luckily we found nothing to be worried of, and so we started to personalise the machine. On this level of hardware Windows 10 ran really well, there was enough RAM for the system to run smoothly, and for Chrome to gobble up! And RAM is where this system excels over other Gemini Lake-based devices. DDR4 is not cheap, and there has been a slew of machines released in recent months that have cut costs by only offering 4GB of RAM, so it is nice to see the Teclast F5 coming with 8GB of DDR4 RAM. What is interesting to see is that unlike the Teclast F7, we do not have any eMMC based flash storage for the operating system. Instead the 128GB storage is a removable M2 2242 SSD drive (22mm by 42mm in size!) that can be replaced with faster and greater capacity drives. Don’t get us wrong, the 64GB eMMC on the Teclast F7 was useful, and for extra storage it was fine, but it was rather slow, but thankfully the F7 also had a 2242 SSD slot. The 128GB SSD in the F5 is a Teclast branded drive and it achieved sequential read speeds over 500MB/s but write speeds were much slower, at around 150MB/s. Sure in a device like this we won’t really notice that, but cloning your 128GB drive to a faster drive with greater capacity will provide a much better experience. The Teclast F5 has a 3850mAh battery, and in our tests that ran to approximately three hours of usable time. Our tests involved writing articles in Google Docs, watching a few videos, surfing the web and running apps such as Fritzing. Now, this battery life isn’t brilliant, but it is enough for most commuting users/makers on the move. But just like an Apple event, there is “just one more thing…” Our battery would charge to 100% but upon removing the power supply it would drop to 88% in mere minutes. This would occur even if left on charge overnight, and we spent some time turning off all hibernate/suspend states to ensure that the machine was fully off before charging. While this may impact the usable time of the laptop, it has yet to become a serious concern. Another power related issue is the charger, specifically the power it produces. While this may be a USB C device, it uses the USB C connection but with 12V 2A (24W) so this means you need to be careful when purchasing a localised power supply. Check before you but as USB C chargers compatible with Apple devices are NOT compatible with the Teclast F5. The F5 has very few ports and buttons around the chassis. Most noticeable are the volume rocker and power button on the left side of the unit. These sit proud of the unit, but in our tests, involving a trip away to a conference, we never accidentally triggered the unit to power up. Also on this side is a 3.5mm headphone port so you can use your favourite headphones when working. Moving over to the right side of the F5 and we have the USB C port, more on that later. Also present are a micro HDMI port to connect to an external monitor (4K @30Hz!) so we can have dual screens...or even a triple screen setup if we use a dongle! The next port is a micro USB 2.0 port, this can be used with full-size USB devices, if you have a micro USB to USB adapter. Next to this we have a microphone, which is sufficient for Skype calls, but not for your YouTube channel! The last port is a micro SD slot which can be used to augment your storage, but this is only USB2 speeds so not much use for those editing videos etc. Do you need to connect a USB drive to the Teclast F5? Need Ethernet? Want to connect a third screen? Then you will need a USB C dongle! To keep the F5 slim and light, USB C is used to augment the ports and provide the functionality we need. USB C can be used for charging (PD, Power Delivery) and we purchased a Lenovo USB C hub that provided us with full-size USB 3 ports, HDMI (4k @ 30Hz), SD card reader, Gigabit Ethernet and had a PD port to enable the F5 to charge while using these devices. In our tests everything worked after Windows 10 detected and configured the devices. So as we n=mentioned a few lines previously, we can connect two additional screens to the F5, using the micro HDMI port, and an HDMI port via USB C, so in theory we can connect two 4k screens to the laptop and be ultra productive (one screen for cat memes, another for Twitter and the final for work.) We tested this with two external 1080p HDMI screens and 1080p YouTube content playing on one screen, Tweetdeck on another, and some Google Drive documents in the final screen. The F5 just kept going, quite remarkable given the size. The Teclast F5 is not just a laptop, it is a 2 in 1, which means that it can also be used as a tablet. By rotating the screen 360 degrees, we automatically turn off the keyboard and touchpad, and Windows 10 switches to tablet mode and we can navigate, open apps and turn pages using just a swipe of our finger. The hinges that enable this action are strong and provide enough friction to maintain the desired screen tilt. 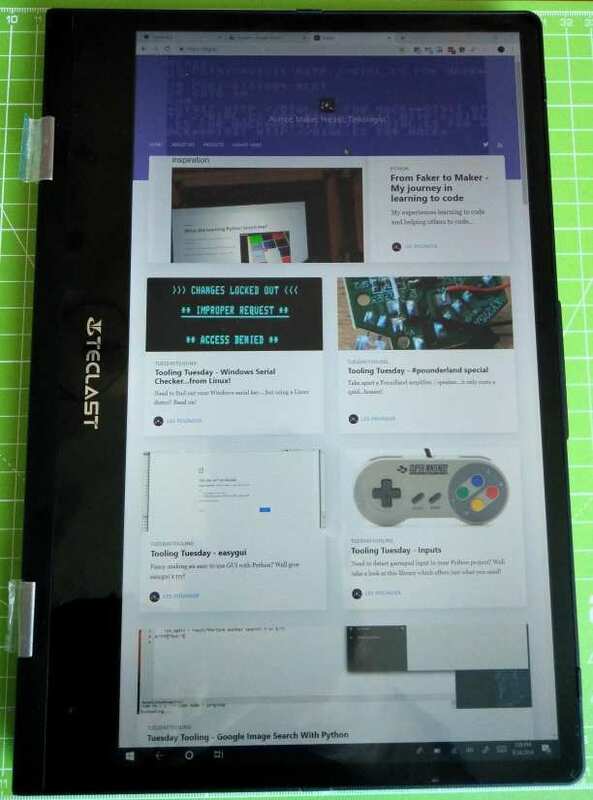 So we can read a PDF magazine as if it were a real magazine, and we can draw on the screen using the Teclast active stylus (sold separately for around $20.) the active stylus states that it has 1024 points of precision but in our tests with Autodesk Sketchbook and Medibang Paint we found the precision to be a little hard to master, but with practice we are sure that a confident user would be able to master this. Palm detection when using the active stylus is tricky, the stylus needs to touch the screen before your hand, so care is to be taken. 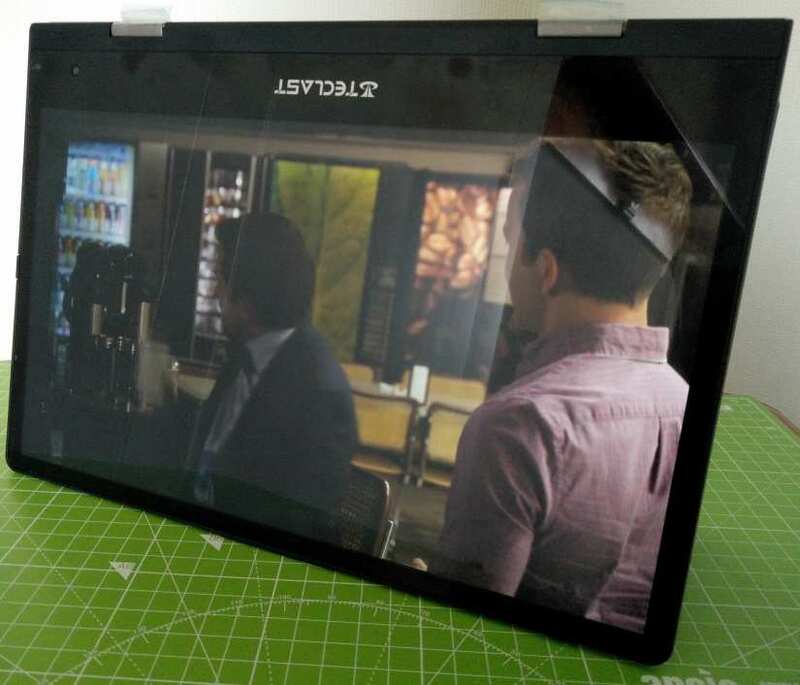 The F5 can also be used in ‘tent mode’ for when you want to watch Netflix, play games etc. 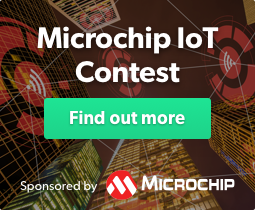 Wireless connectivity comes in the form of an Intel AC 3165 wireless card, that provides WiFi (a/b/g/n and ac) so we can connect to 5GHz access points and enjoy the extra bandwidth! Bluetooth 4.2 is also provided by the Intel card, and it works really well. We connected up to our Bluetooth speaker and played many hours of Spotify, but there was an issue. If we moved more than 4m away from the speaker our connection became choppy and distorted, and moving further away caused it to get worse. We tested the speaker with two other Bluetooth devices and they all worked at greater distances, so there must be a bug with Bluetooth, hopefully, this will be fixed in the future. 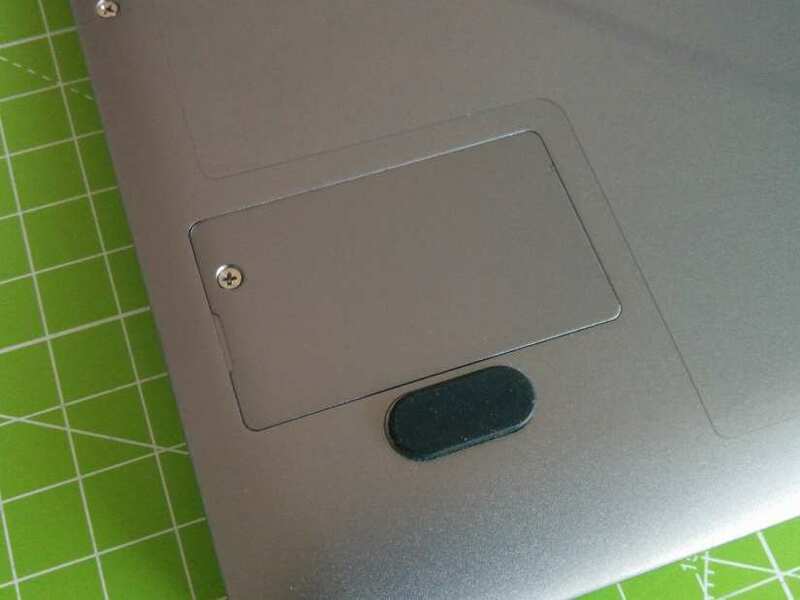 There seems to be a current trend for laptop makers to have the webcam in the bottom right of the screen. 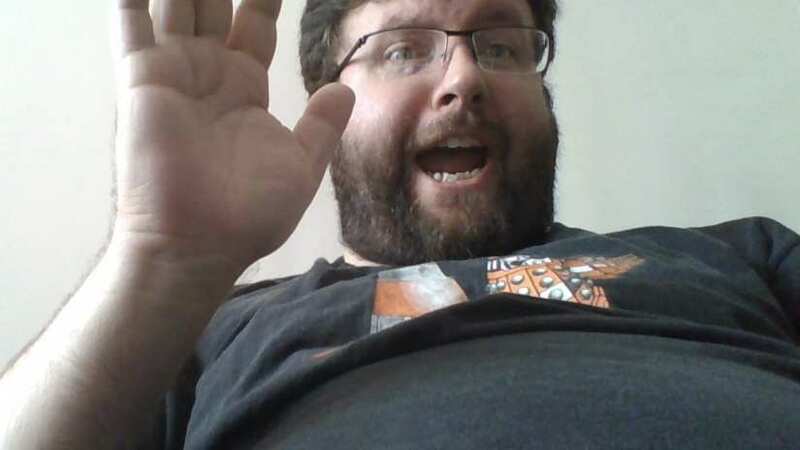 The Dell XPS 13 has this camera placement and it is really unflattering. If you want to video conference with clients/colleagues then they will get to see your jaw and nostrils … a lot! Camera quality is basic but functional and good enough for conference calls. If you wish to record YouTube videos, then you will need to get a better webcam. The audio is basic but clear enough for a conference call, but there is an annoying buzz to the background. 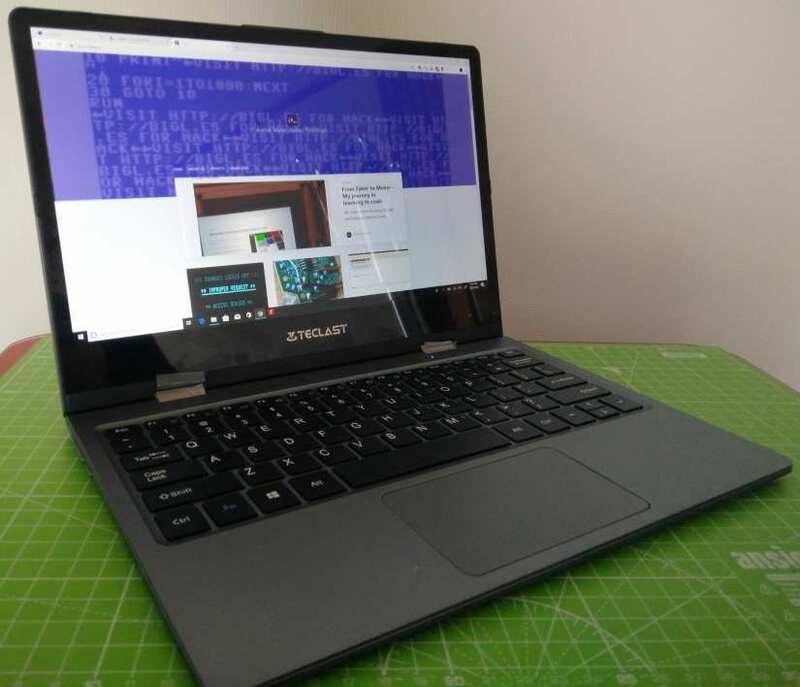 Hey, I’m a maker, is this laptop any good? Long answer, well yes this is a great laptop and it ticks all the boxes that the F7 did, but gives us more RAM, DDR4 vs DDR3, a faster CPU, and a touchscreen. But Makers need USB ports, and while we can use USB C dongles and micro USB adapters, these come at a cost. The biggest cost being USB C hubs which add another $75 in our case. Full-size USB ports would have been really nice, but we understand that the size of the laptop controlled this decision. If you are happy to use dongles etc, the F5 is great. But for those of us that want full-size USB, then the F7 has the edge. Windows 10 for makers is a fine platform. It runs quick enough to keep up with our workflow, and stays out of the way when we are working to a deadline. We loaded up the Arduino IDE and took it for a spin. Compiling the blink sketch and uploading to our Uno took mere seconds. 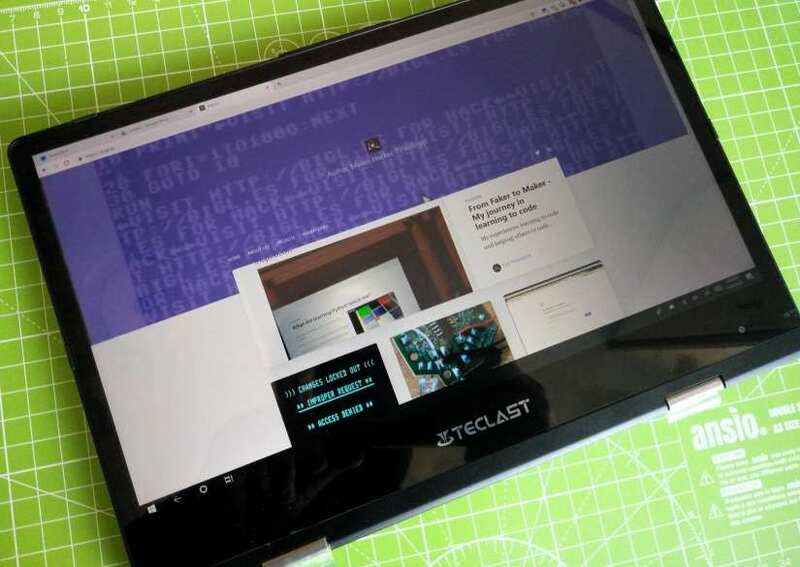 We hacked and reviewed the EMF Camp 2018 badge article on the Teclast F5 and it was a pleasure to do. Using PuTTY to open a serial console to the badge we quickly and easily hacked around with no issues from Windows. When we needed to do some work in Python, we installed the Python for Windows (3.6 and 3.7) files and had access to Python via the Command Prompt and we were even able to install packages using pip. By default, the IDLE editor is installed, but we also installed Mu from Nicholas Tollervey and we very quickly managed to hack around with Adafruit’s Circuit Playground boards while on the train to Cardiff. Oh dear. As you can guess dear reader we were a little disappointed with Linux support. We fired up an Ubuntu 18.04.1 USB stick and installed to a spare 2242 SSD. Ubuntu booted and we had keyboard, mouse, correct screen resolution and Bluetooth. But then we noticed no WiFi, touchscreen or rotation sensor. No problem, we connected the USB C dongle and connected to the web via Ethernet. Looking up the WiFi drivers first, the WiFi is the same chip as present in the Teclast F7 (Intel AC 3165) and following the guidance on Intel’s site we installed the firmware and loaded it ready for use. A quick reboot and nothing ... no devices found. We tried this a few times, renaming firmware files and tinkering with the configuration, but alas no WiFi. The same result was met when searching for drivers for the touchscreen. Apparently, the touchscreen was supported in an older Linux kernel, but not in the newer kernels. Why this is so, we do not know. To make sure that it wasn’t just Ubuntu, we tested Linux Mint and Manjaro and the same issues befell us there. 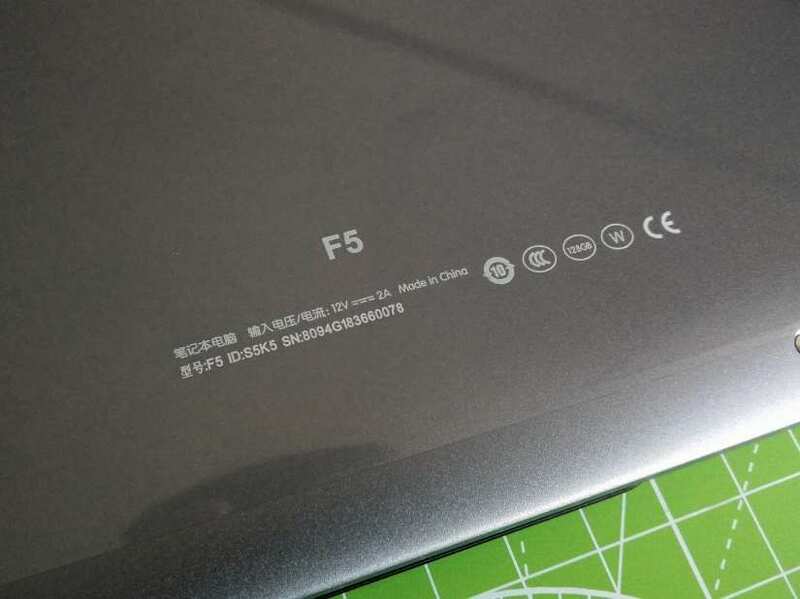 We shall not be giving up on this, but for the purposes of this review we have to state that the Teclast F5 is not suitable for Linux users, a real shame! So is the Teclast F5 any good for entertainment? Yup! We ran Netflix and forced ourselves to watch a few episodes of Designated Survivor and they all streamed quickly with very good picture quality. Youtube videos at 1080p 60fps ran smooth and the WiFi (5GHz AC) kept up with our demands for more Big Clive teardown videos and TheRadBrad Shadow of the Tomb Raider videos. We wanted to test the games performance, so we installed Steam and installed a few games. Star Wars Battlefront 2 (the original version) ran superbly and we cranked up the settings to enjoy 1080p space adventures in a galaxy far … far away. So, let's test this to absurdity … can it run Doom 2016? Well, it can run the title screen, but after that it just died, even at the lowest settings. Which was to be expected. 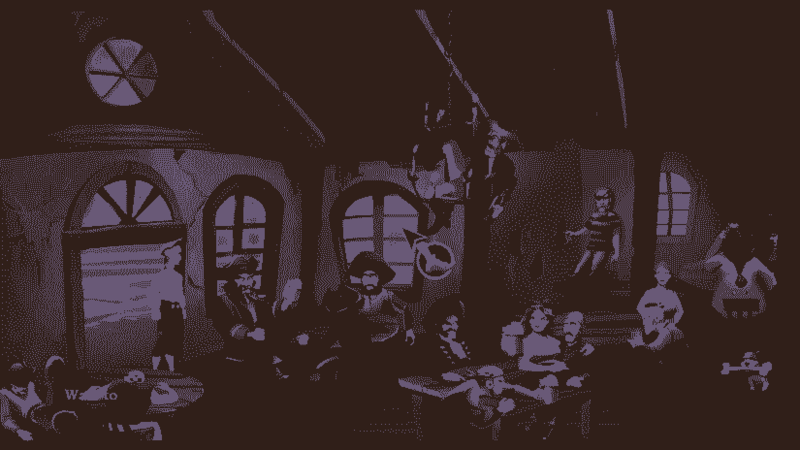 We also tested with The Secret of Monkey Island 1 & 2 Special Editions, and while they are not the most demanding games, they played brilliantly and many hours of fun were had. But can it run … Crysis? Yes dear reader it can! So the Teclast F5 can be fun for those of us wanting to player older games on Steam, but the latest titles are sadly out of our reach. The Teclast F5 is a remarkable piece of kit given its size. It packs a lot of power, enough for the maker on the move, the office worker and the commuter who wants to enjoy themselves during the daily grind. While we do lose USB ports, we do gain USB C which adds many more ports but at a cost. The fact that the F5 is a tablet and a computer is great for entertainment, reading magazines, playing games. While the keyboard is good enough for those requiring a portable work machine. Windows 10 runs well, and there were no major issues faced during our tests. The 8GB DDR4 RAM is most welcome and the upgradable SSD means that this device can grow with the user. At around $350 this laptop is $70 more expensive than its predecessor the Teclast F7, but for that $70 we get a better CPU, more RAM and a smaller chassis. There is just a worry that the battery life is a little short, and that the battery is not charging correctly. For those wanting a small, thin laptop and they are happy with Windows, then the F5 is the clear winner. But for those of us that use Linux as our daily driver, as many makers do, then the F7 is still a viable alternative.